Northwest of BISCARI, SICILY, 10 July 1943: During the initial invasion of Sicily, several American parachute units were given the task of blocking German movement toward the landing beaches. One unit, the 3rd Battalion of the 504th Parachute Infantry Regiment, landed two miles northwest of Biscari. After gathering as many of the scattered troopers as possible, the understrength battalion moved out toward the town of Niscemi. As they approached the Niscemi-Biscari highway, they encountered and captured two Italian anti-tank guns. With the newly acquired guns bolstering their defences, the paratroopers dug in at positions covering the main highway. Near CARENTAN, FRANCE, 11 June 1944: At dawn on 10 June, the 101st Airborne Division was to step off in an attempt to capture the key road and rail junction of Carentan. American occupation of Carentan would link the Utah and Omaha beachheads. Charged with defending the town was Major Friedrich von der Heydte and his crack Fallschirmjager-Regiment 6. There, the Germans established a series of barriers on Route Nationale 13. To reach the town, the Americans would have to cross a causeway carrying the highway from Saint-Come-du-Mont through the low-lying swamps. On the 11th, a concerted attack was launched against the extended German paratroopers, but the going wasn't easy for the "Screaming Eagles." As the 3rd Battalion pushed toward the town, Germans in a cluster of farmhouses sheltered by hedgerows poured rifle and machine-gun fire into the exposed Americans. Pinned down and subjected to withering fire whenever he attempted to move forward, Lt. Col. Bob Cole, in command of the 3rd, finally tired of the steady losses. He radioed for a smoke barrage on the farm complex and ordered his men to fix bayonets. CHAMP, BELGIUM, 25 December 1944: Christmas Day found the American garrison of Bastogne surrounded. The Germans marked the holdiay with an assault on the hitherto quiet northwestern perimeter, with Bastogne as their goal. Spearheaded by Kampfgruppe Maucke of Panzergrenadier-Division 15, the attack pushed off at 0300. They pierced the line of the 327th Glider Infantry Regiment and proceeded eastward, while to the north, Grenadier-Regiment 77 of the Volksgrenadier-Division 26 broke into Champs and engaged Company A, 502nd Parachute Infantry Regiment. In response to the battle in Champs, Companies B and C of the 502nd were ordered forward to positions east of the village. Kampfgruppe Maucke split up at dawn, with the smaller element moving north to bypass Champs, where it encountered and destroyed two American tank destroyers at a cost of two tanks. It then unknowingly advanced toward a collision with B and C companies. HITDORF, GERMANY, 6 April 1945: As the Third Reich collapsed, many American leaders became bold to the point of recklessness. Often, a daring stroke by a small group of GIs yielded a vast gaggle of demoralized German prisoners. But sometimes, the American pushed their luck too far and the Germans, like a wounded animal, would lash back with stinging effect. At early dawn, Company A of the 504th Parachute Infantry Regiment crossed the Rhine and advanced toward the town of Hitdorf. Unfortunately, element of Volksgrenadier-Division 62 had just linked up with the lingering remnants of Panzer-Division 11, and these Germans were not yet willing to throw down their arms. The landings went easily enough, but as the paratroopers entered the town, they were met by an enemy company that had been rushed to the sector. YANKS is back, and better than ever, as it now includes the essential elements of PARATROOPER and 25 additional scenarios. 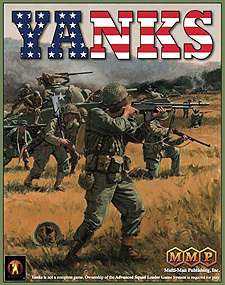 YANKS contains the entire United States Army order of battle for ASL, including five different squad types, their half squads, leaders, and all the varied vehicle ordnance, support weapon, and crew counters, thus enabling you to command every type of combat unit used by the American Army in every theatre throughout the war. Chapter H contains 24 pages of detailed notes on guns and vehicles, complete with some minor updates to the original. Also included are eight map-boards: 16-19, 24, 40, 41 and 46, which will help you play many of the 41 scenarios inside YANKS. Included are the 16 original scenarios from YANKS and PARATROOPER (all re-balanced) as well as 25 more out-of-print scenarios, re-numbered and re-balanced, all with existing errata incorporated. New errata have been issued for the old scenarios to reflect the balancing changes made in these updates. YANKS is not a complete game. Ownership of the Advanced Squad Leader Game System is required for play.